Today was the last dance class for this season. I really think the girls learned a bit about themselves or simply just gained a little courage by taking this class. It took them about three weeks to settle in, but after that they were happy, independent dancers that enjoyed learning new things. It was nice to watch them gain comfort and confidence by trying something new. 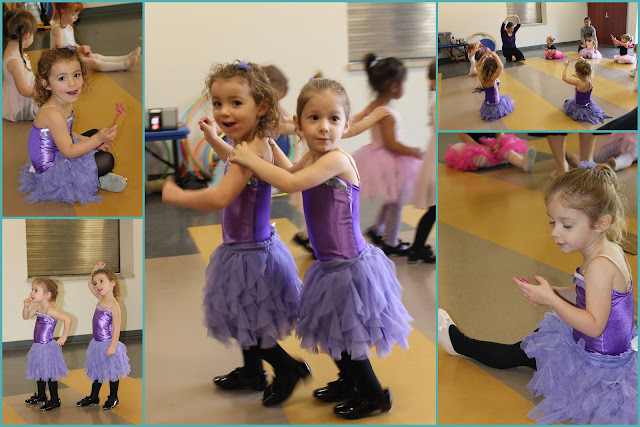 These Saturday morning were not just about dance class ,we always seemed to make an outing out of it! Near the recreation center where the dance class was held there was the best park ever and at this park lived many, many Rolly Pollys. 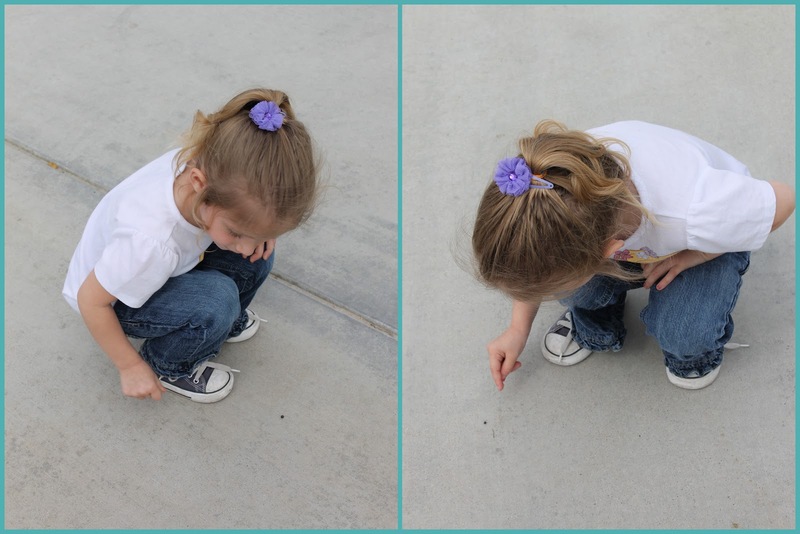 Ellie figured out pretty quick that if she touched these creatures they would roll up in a ball and she could fling them across the side walk. She loved her little friends that waited for her outside her dance class. 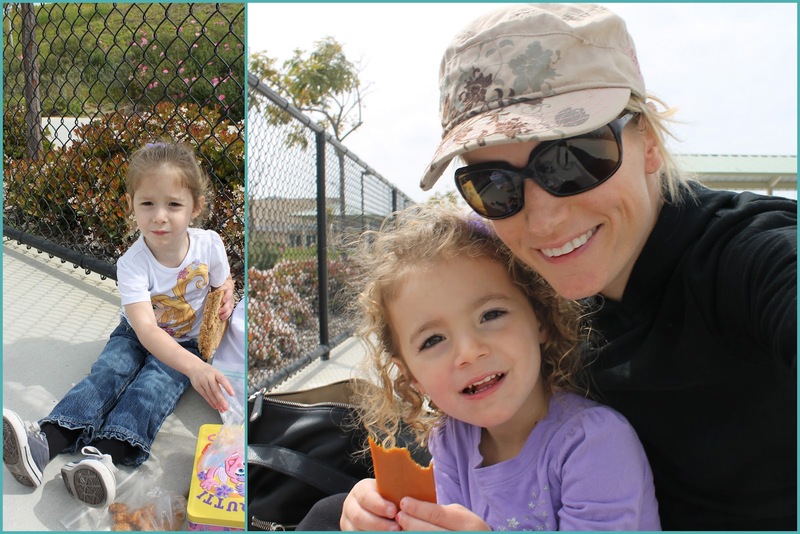 After we managed to roll up as many Rolly Pollys as two toddlers could handle we would share a picnic lunch before we headed to the ultimate attraction the Tire Swing! I really looked forward to these Saturdays, so simple yet so sweet! I believe swim lessons are the next organized recreational activity for the girls, lots to look forward too! 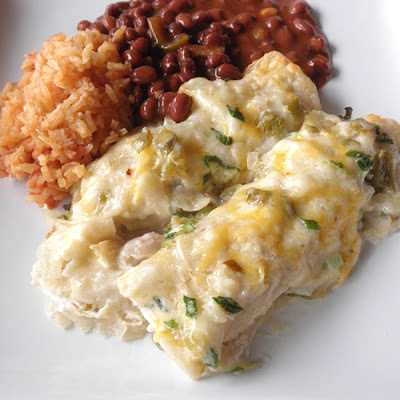 The following recipe is the result of my attempt to make a light dessert to go with some rich enchiladas suizas I made for some guests last night. My plan, and what we did eat was strawberry shortcake. I wanted chocolate, though, so I whipped up some chocolate ganache to use on the side, or as an extra topping for the shortcake. Mmmm...chocolate tastes good with strawberry shortcake. I decided today to stack the ingredients for a cute bite-size dessert. My sister-in-law liked it too, but thought it might taste better with some whipped cream, so I suppose you could put that on the side for dipping. I think that would be awesome as well. For now, this is what I've done, and this is what I have pictures of. At any rate, these are a nice addition to my growing collection of miniature desserts. By the way, the amounts below are my best guess. You might end up with too much of one ingredient or another, but each is so yummy on its own, I doubt you'll have trouble finding a reason to eat them. Place chopped chocolate in a medium sized heat-proof bowl. In a small saucepan over medium heat, bring cream and butter to a simmer. Once cream/butter has come to a simmer, pour over the chocolate and let sit for about 10 minutes. Stir chocolate and cream with a rubber/silicone spatula until completely mixed. Set aside to cool to a pudding-like consistency, about an hour and a half to two hours, if room temperature is about 70 degrees Fahrenheit. Once the chocolate ganache (chocolate and cream mixture) is the right consistency, spoon about 1/2 to 1 teaspoon onto each angel food cake cube. 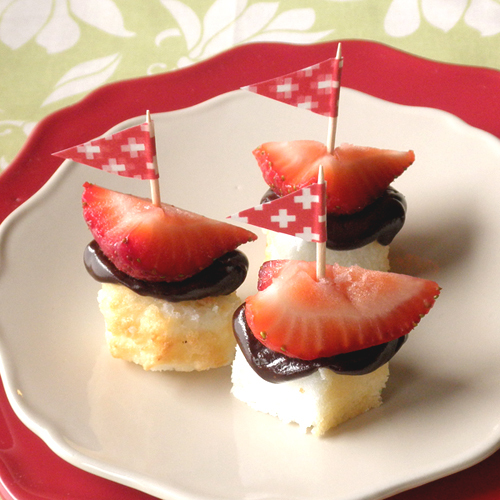 Pierce a strawberry quarter with a toothpick so that about half an inch extends beyond the bottom of the piece of strawberry, and then poke into the chocolate-topped cake cube. Pop one in your mouth to see if they taste good. They do. It's my turn to host for Club: BAKED! 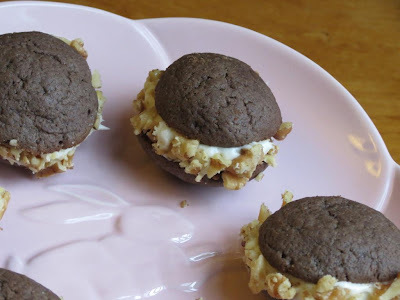 I thought it would be fun to give these Red Velvet Whoopie Pies a go and then forgot to add the red food coloring, go figure! 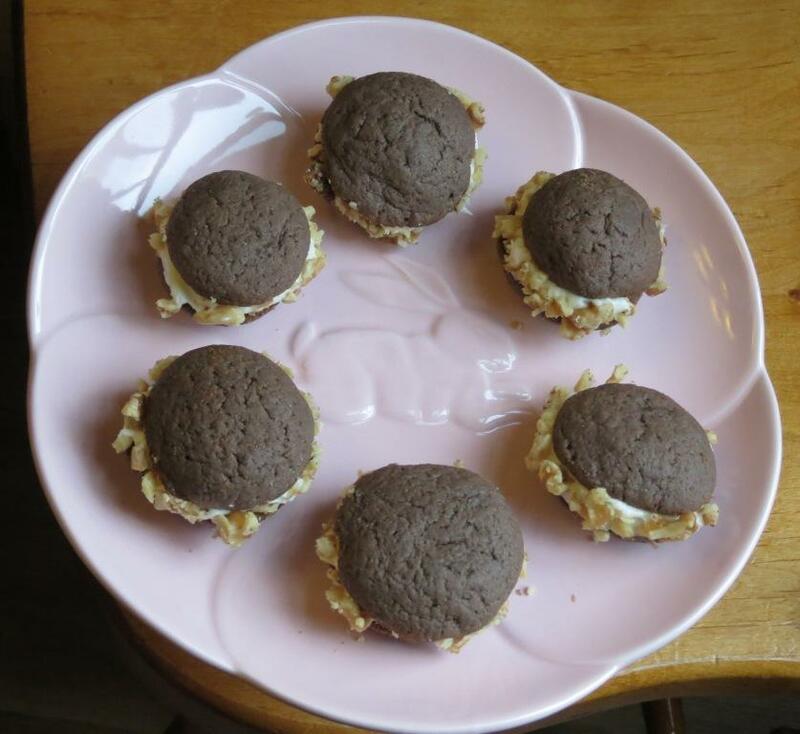 So here are my Brown Velvet Whoopie Pies :) I've never had or made whoopie pies before although I see them all over. They've always looked like a fun treat to me and now I know that they are! In a large bowl, sift together the flour,cocoa powder, baking powder, baking soda and salt. Turn the mixer to low. Add the flour mixture, alternating with the buttermilk mixture, in three separate additions, beginning and ending with the flour mixture until just combined. 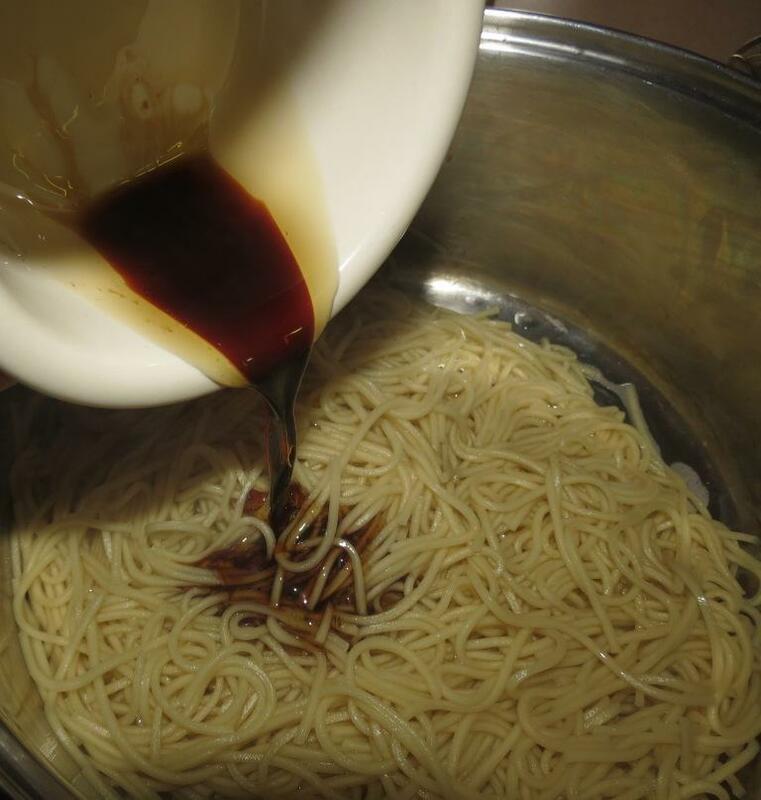 Scrape down the sides and bottom of the bowl , then mix on low speed for a few more seconds. Remove the batter from the refrigerator. Us a a small ice cream scoop with a release mechanism to drop heaping tablespoons of the dough onto the prepared baking sheets about 1 inch apart. Bake for 10-20 minutes, until the cookies are just starting to crack on top and a toothpick inserted into the center of a cookie comes out clean. Let the cookies cool completely on the pan while you make the filling. Use an ice cream scoop or a tablespoon to drop a large dollop of filling onto the flat side of the cookie. Place another cookie, flat side down, on top of the filling. Press down slightly so that the filling spreads to the edges of the cookie. Turn the whoopie on its side and roll through the walnuts. Repeat until all the cookies are used. 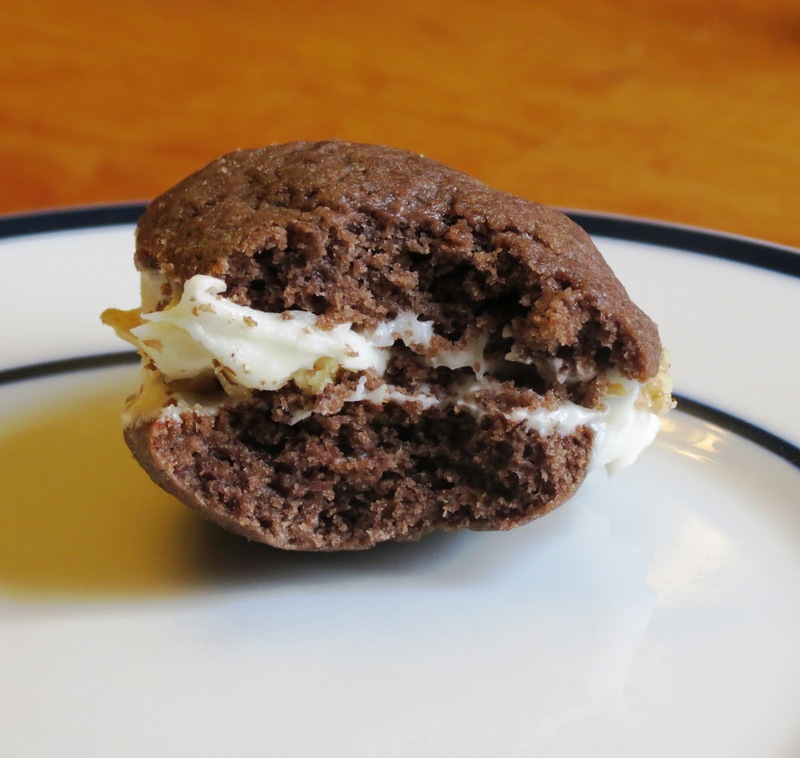 Put the whoopie pies in the refrigerator for about 30 minutes to firm up before serving. 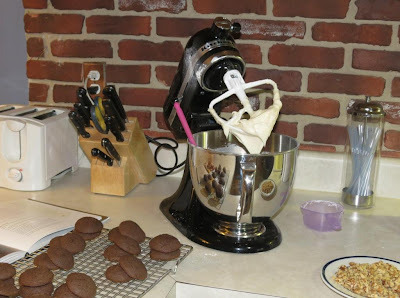 The whoopie pies will keep for up to 3 days on a parchment lined baking sheet covered with plastic wrap, in the refrigerator. 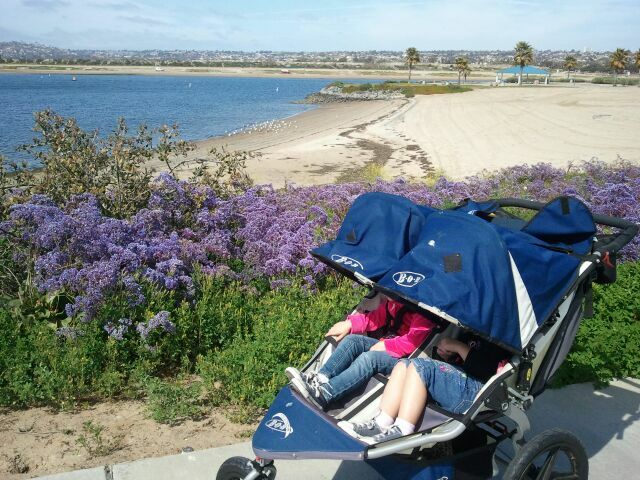 My sister's fiancee and his kids were in town today. I knew the kids when they were little, but have not been around them in years. It was fun to get to know them again. I was reminded of what great kids they are. We went out for lunch at Brandon's favorite restaurant. Then we went to Granny and Poppy's. Eymber turns 14 this week, so we celebrated her birthday with carrot cake and presents. My parents had taken Eymber to an art store earlier this week and let her stock up on pens and pencils and sketchbooks. She spent the whole afternoon drawing. She is an amazing artist and draws constantly - even on her straw wrapper at lunch! Granny had plans for all the soon-to-be-cousins to get to know one another. Granny has long been known as the Bubble Lady and she discovered a fun new way to play with bubbles. Cut off a plastic bottle and secure a washcloth over the bottom with a rubber band. Dip in bubble solution and blow. Such fun! The bubbles come out in long tubes. Orion was the first to realize that these bubbles could be a great beard. At 12, he is in that awkward place between child and teen. Today, he was happy to just be a kid. Rachel followed him around and charmed him into playing with her. She kept running over to me and announcing "I like Orion!" Anthem used his bubbles to make sculptures. Granny and Robie got in on the bubble fun, too. The kids played together all afternoon. Rachel kept Orion occupied. Katherine and Anthem ran around, flitting in occasionally to ask unusual questions like "Why is 11 called 11?" It was a fun day. And I'm looking forward to more cousin time in the future. This is a dish that my non-casserole-eating husband requests on occasion. They are rich, mild, and so, so good. The recipe comes from my favorite recipe webiste, Allrecipes.com. Love that site. Anyway, I'm on my way to Zombie Burger and don't have much time to write my little paragraph here. If I wasn't on my way to Zombie Burger, I would be eating these leftovers. Maybe tomorrow for lunch. Try these. You'll like them. *Side note update on Zombie Burger. Yesterday was my first visit to the hip, new Zombie Burger, and I have to say I was pleasantly surprised. My kids were weird and didn't totally love it--maybe the zombie theme freaked them out and dampened their appetites. At any rate, I ordered the Walking Ched: breaded & deep fried macaroni & cheese "bun," bacon, cheddar cheese, caramelized and raw onion, and mayo. Oh my gosh, it was good! Of course, I couldn't eat the whole thing, but I'm glad I ordered it, and that's saying a lot from this picky eater. My Walking Ched even had admirers as the two guys at the table next to ours kept looking over at my plate and finally asked how it was. Good times. Good food. I love them. In a heavy skillet, lightly fry tortillas in shallow oil, being careful not to make them too crisp to roll. Combine the cheeses and keep 1/2 cup aside for topping. Dip each tortilla in salsa verde (both sides.) 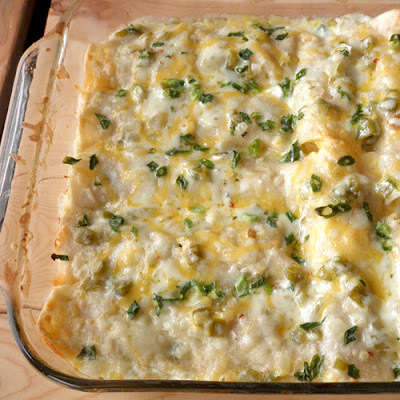 Place 2 heaping tablespoons chicken and about 2 tablespoons cheese down the center of each; roll and place seam side down in a shallow 9 x 13 dish. Bake uncovered in preheated oven for 20 minutes. Serve immediately. Doesn't this look yummy? 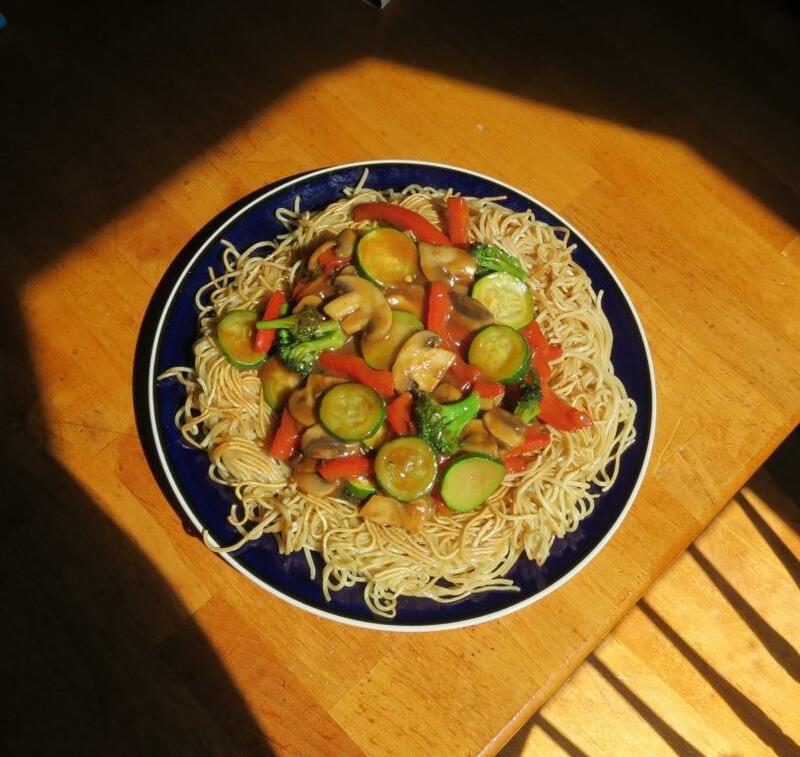 I really lucked out with this week's Random Recipe! 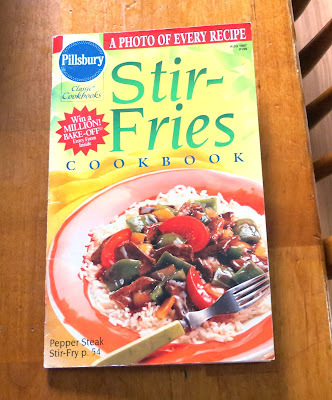 My randomly selected cookbook was Pillsbury Classic Cookbooks #198, Stir-Fries Cookbook from August 1997. 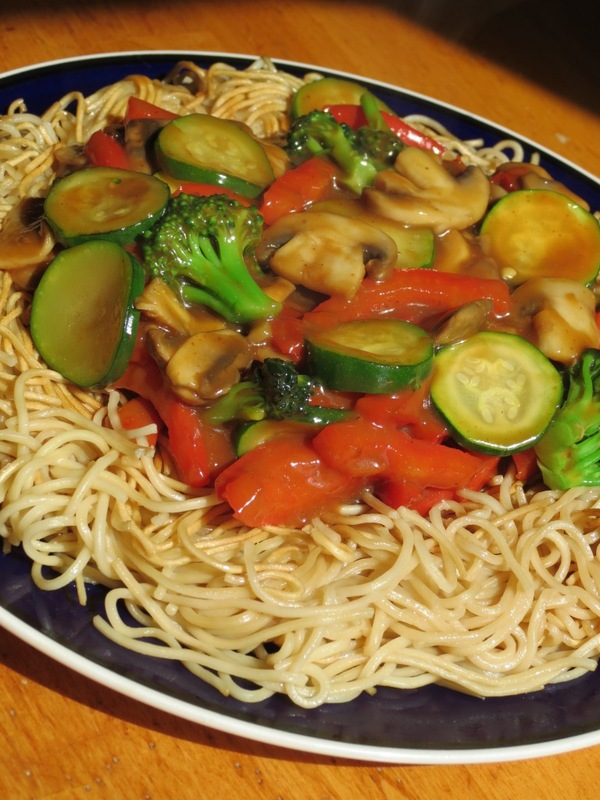 Whisk together all ingredients thoroughly, add to cooked vegetables in hot wok and stir for 30 sec - 1 minute until thickened and glossy. 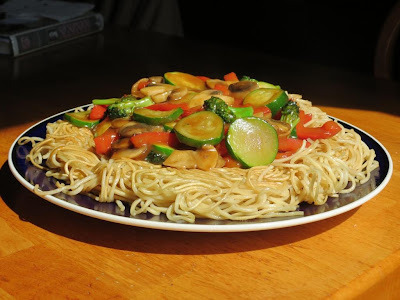 To use it in this recipe just whisk it all together and add it in when the recipe says to add stir fry sauce to the wok. 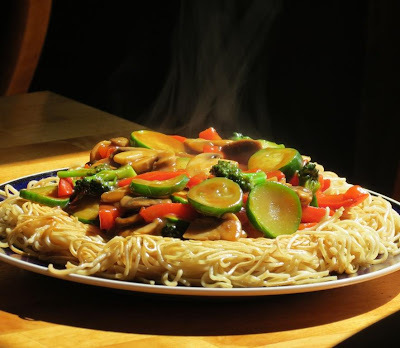 Cook noodles as directed on package. Drain well. 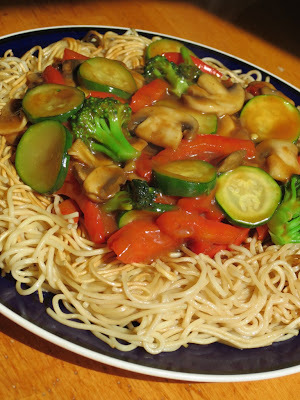 In large bowl, combine cooked noodles, soy sauce, and sesame oil. 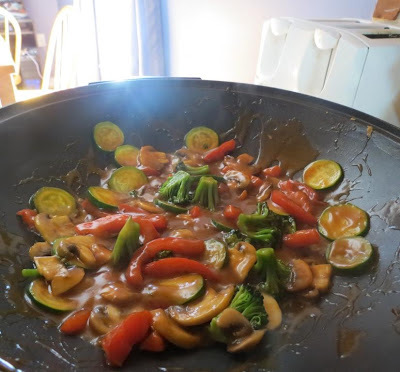 Heat 1 tablespoon of the peanut or vegetable oil in a large nonstick skillet or work over medium0high heat until hot. Slide pancake from skillet onto plate (this is a little tricky); invert pancake onto another plate, browned side up. 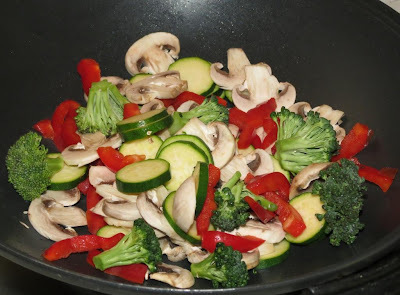 Add another 1 tablespoon oil into skillet or wok. Slide the noodle pancake into skillet, browned side up; cook 4 to 6 minutes or until bottom is browned. 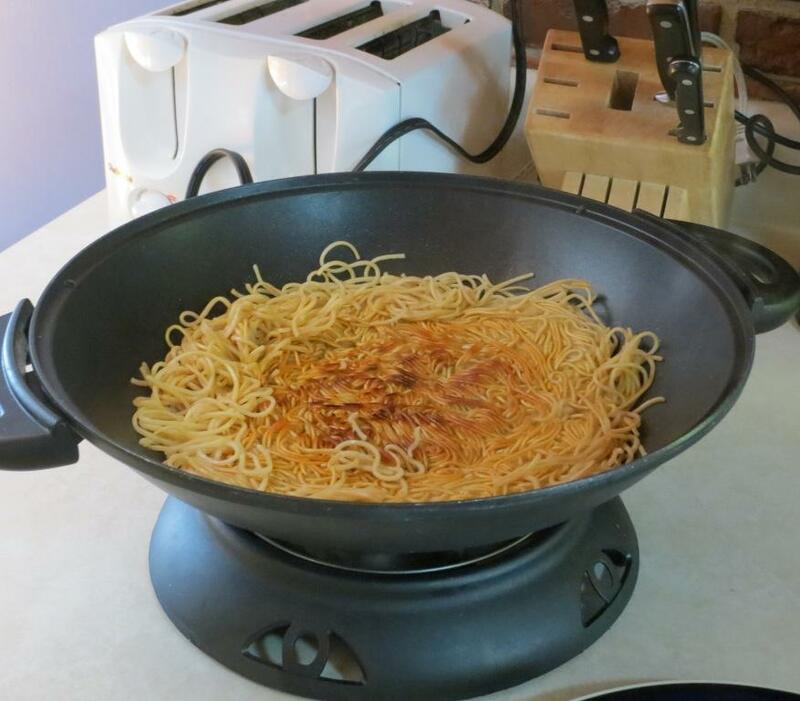 Slide onto serving plate, cover to keep warm. In same skillet or work, heat remaining 1 tablespoon oil until hot, add veggies and stir to coat. Add water and cook 6 to 8 minutes until veggies are crisp tender,stirring occasionally. Stir in stir fry sauce and hoisin sauce. 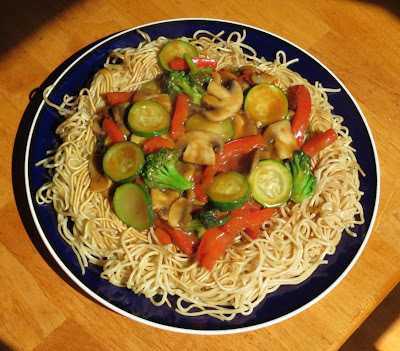 Cook 1 to 2 minutes until thoroughly heated and sauce has thickened and is glossy. To serve, with sharp knife or kitchen scissors, cut hot noodle pancake into wedges. Top pancake with vegetable mixture. I'm sending this off to Sue for Cookbook Sundays and also to Ruth at Once Upon a Feast for Presto Pasta Nights #258. 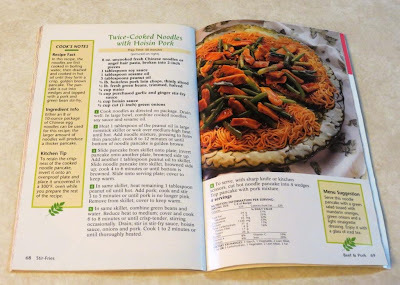 I can't believe we are done cooking Tessa Kiros' recipes over at I Heart Cooking Clubs this week! When we started with Tessa, I honestly hadn't even heard of her, so checked out two of her books from the library -- Apples for Jam and Falling Cloudberries, the only two of her books available in our state library database! As soon as those were returned I knew I would enjoy her books so bought them all over the past six months. I think my favorite would have to be Food From Many Greek Kitchens since I've always loved Greek food and didn't know too much about it. I also loved Twelve and Apples for Jam, although all her books are gorgeous. Put the milk, yeast, and honey in a small bowl and stir until the honey melts. Leave it for about 10 minutes, or until it begins to froth a bit. Put the flour and 1/2 teaspoon salt into a larger bowl. Add the yeast mixture, the egg, and butter, and mix through well. Knead 10 minutes or so and, if it seems sticky, just hold the bowl firmly and move the dough around with your hand, rather than adding more flour. Cover the bowl with a cloth and leave in a warm, draft free place to rise for 1 and 1 1/2 to 2 hours until it has puffed up well. 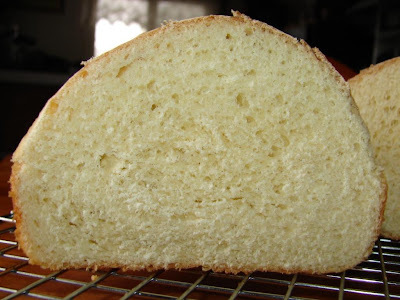 Lightly grease a 12 by 4 inch loaf pan and dust it with flour. Punch down the dough to flatten it and shape it into a rough loaf of a size to fit the pan. 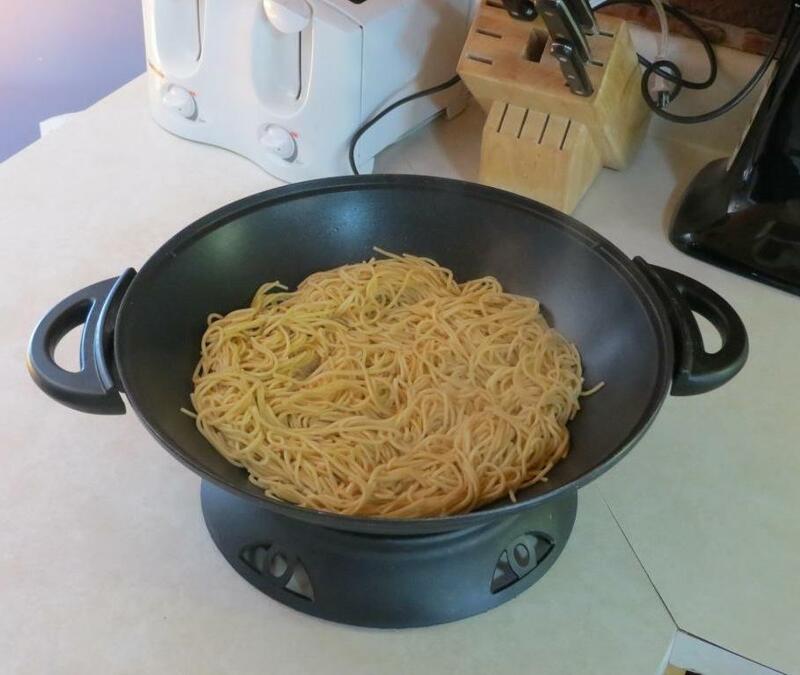 Cover with a cloth and leave in the warm place for another 45 to 60 minutes, or until it puffs right up in the pan. Meanwhile, preheat the oven to 375. Put the pan in the oven and bake for about 25 minutes, or until the top is firm and crusty and the loaf sounds hollow when tapped. 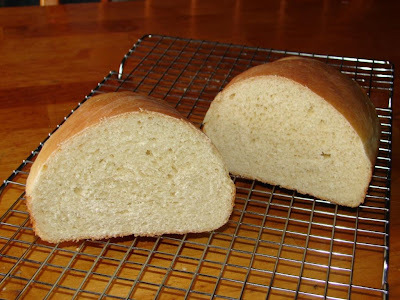 Remove from oven, knock the loaf out of the pan, and cool on a rack in a fly-free zone. This is best sliced warm and spread with butter, but you can keep the loaf for a few days in an airtight container (not a plastic bag) for excellent toast. Makes one large loaf or about 18 small rolls. 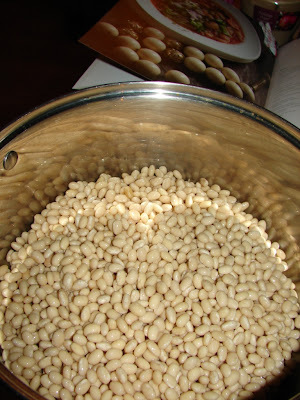 Cover the beans with plenty of cold water and soak overnight. The next day, drain and rinse them, and put into a pot with cold water to cover. Bring to a boil, skimming off and scum that has formed. Drain and rinse again. Wipe and scum that has collected on the pot, then return the beans to it. Add 8 cups of cold water, the whole garlic clove, bay leaf, celery rib, an the 1/2 onion. Simmer, partly covered, for about an hour, until tender. Larger beans will take longer and need more water. Add salt in the last 10 minutes or so. Meanwhile, heat the oil in a soup pot over medium heat and saute the chopped onion until soft and golden. Add the chopped garlic and carrots and when the garlic smells good, add the tomatoes. Season with salt and pepper. Swish about 1/2 cup of water in the tomato can and pour into the pot. Put the lit on and simmer for 10 minutes or so. 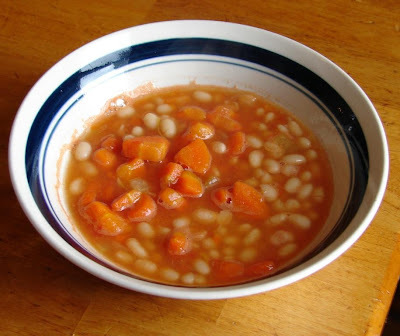 When the beans are ready, pour them and their water in with the tomato sauce. Simmer for 10 minutes, adding a little water if it's too thick. Ladle into bowls and serve with red onion, parsley and celery leaves on top, a drizzle of oil and a grinding of pepper. Both the bread and soup were delicious. My whole family loved the bread and the leftovers made perfect French toast bread. I was a big fan of the soup. The rest of the family thought it was okay, they are their bowl for Saturday lunch but did not want seconds or left overs. Which means that I ate the left overs for about a week myself, but didn't mind one bit. I had never heard of Fasolada before and when I was looking it up online it was neat to find that it is considered the national soup of Greece, and that it is available in cans there already made! It was nice to use some of my huge bean stockpile and I would make this again but probably a half batch since I was the only real fan. 1. Ricotta Gnocchi with Tomato Pesto -- This was my first Tessa recipe, so yummy! 2. Whole Wheat Apple and Pluot Pie -- This was a hit with the kids and I loved using apples we had just picked at the orchard. 3. Winter Squash Pizza Bake -- I was the only one who really liked this but it had such a neat flavor combo that really got me. 4. Greek Almond Halva -- this was another one that only I liked, but it was so yummy, I'm just waiting for an occasion to make another batch! 5. Tuscan Baked Eggplant -- this was so yummy, I wanted to make batch after batch of this one, a must try for eggplant fans! 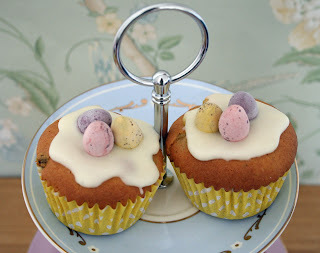 When I started blogging it was with the intention of trying new recipes and being a little more adventurous with my baking. 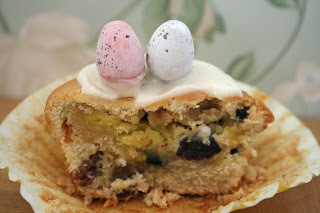 I certainly think it has helped me to achieve this...however, with regard to these simnel muffins, I've made them for the last 4 years in a row and they really are delicious and a firm favourite...so I thought that I'd share them with you! As the recipe says traditional simnel cake can be a bit too rich - instead, try these light little muffins with a gooey nugget of marzipan baked in the centre. Now I'm not the biggest fan of marzipan but these muffins just taste like they have a soft almond paste inside. 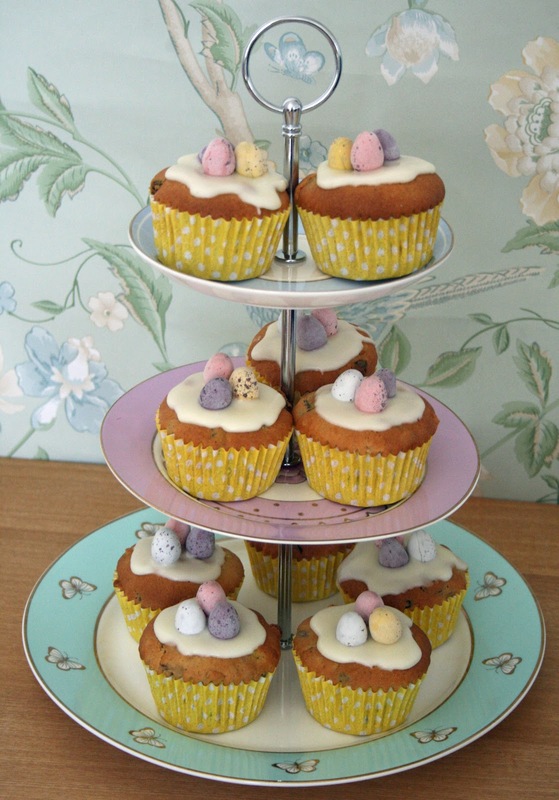 They're also beautifully spiced and the fruit is infused in orange juice and the icing has orange juice in too. It all marries together perfectly to give a muffin that will surprise your friends and it will be sure to bring you compliments...have I sold them to you yet? 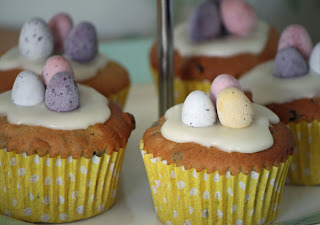 ;-) Why not give them a try...there's still a week until Easter! Put the mixed fruit and orange juice and zest into a bowl, you can then either leave it to soak for an hour or pop it into the microwave for 2 minutes on medium. Heat your oven to 180c/160c fan/gas 4. Mix the sugar, flour, butter, eggs, milk and spices together in a separate bowl, the mixture should be nice and light and fluffy. This could take around 3-4 minutes. Once you reach this stage stir in the fruit. 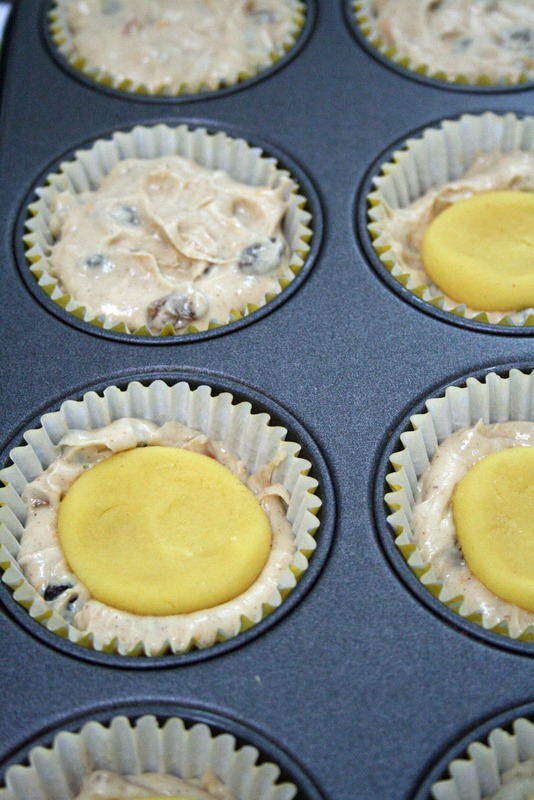 Half fill each muffin case with a little mixture and then place a disc of marzipan on top of each. If you want to be really accurate/pedantic each ball of marzipan will be about 14g... but I think 10g could also be sufficient if marzipan is not your favourite. You should roll the marzipan into a ball and then flatten into a disc with your thumb. Make sure your marzipan isn't too close to the top, otherwise you'll end up with a marzipan volcano flowing out as they split asunder! Finally, spoon the remaining cake mixture over the top. Bake for 25-30 minutes...your muffins should be golden in colour. Once cool you can then add the finishing touch. Mix the icing sugar and orange juice together, it should be a fairly thick consistency. Drizzle over each muffin and then top with a cluster of mini eggs. i saw this idea in a magazine a few years back and it has been stuck in my memory and this year we finally got around to making it. a rock large enough to cover the opening of the smaller pot. we first read one of the kid's Easter books. we talked about where they took Jesus after he died on the cross. we went outside and filled the larger pot with dirt. the smaller pot, was used to make the cave. we used water during the process to mold the dirt into the right shape. then we added the seeds. our garden is growing! easter week, we will add 3 crosses to the garden. Sometimes it's the simplest of activities that are the funniest! 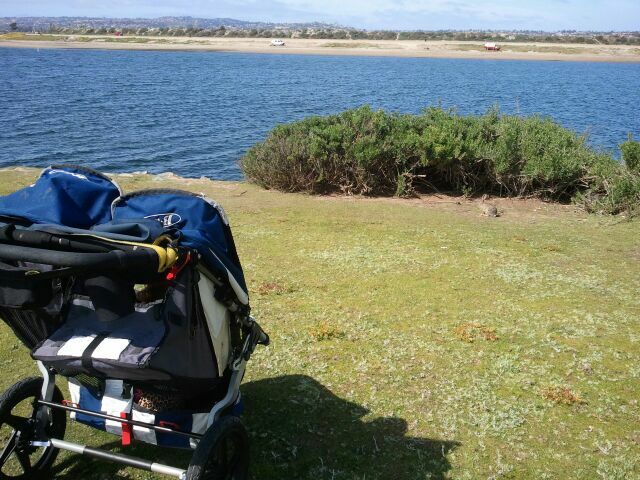 After picking the girls up from day care after work one day last week, we went for a walk down by the bay. As we were walking Ellie was full of one liners that had me cracking up. First, she saw this bunny (pictured below), but of course it was no regular bunny because it is only two weeks away from Easter so of course to Ellie it has to be the Easter Bunny. She's yelling at the 'Easter' Bunny "PLEASE bring me Eggs and lots of Chocolate, Lola wants Chocolate too!" While wrapping up our walk, I hear Ellie yelling something again- I think she is talking to another bunny, but I couldn't quite make out what she was saying. I stop walking to listen and she is screaming at the top of her lungs, "STOP winding trees, TREES STOP winding!" I conclude that Ellie is not a fan of the windy afternoon and it was probably time to wrap up our walk, but not before I ask her to repeat that statement a few more times so I can laugh a few minutes longer. I LOVE toddler speak and know I will miss it when it is gone!